With spring around the corner, fuel prices up, commodity prices down, and water restrictions or limits in many parts of the state, it's time to consider adding economical tools to better manage your irrigation application timing and amount. These tools can save you energy and water without sacrificing yield. Figure 1. Key components of an atmometer installed approximately 40 inches above ground in a pasture. Two tools used in the Nebraska Agricultural Water Management Network are atmometers and Watermark® sensors. Atmometers or ETgages act as mini weather stations to provide reference evapotranspiration (ET) information for nearby fields. Information is displayed on a site tube mounted in front of a ruler on the instrument. Reading the site tube is like reading a rain gauge in reverse as you watch to see how much the water level drops each week. A grower or crop consultant can use an atmometer to quantitatively gauge how crop water use varies from week to week and season to season with changing weather conditions. This is more accurate than using an average number for a given season or growth stage. Atmometers consist of a wet, porous ceramic cup (Bellani plate) mounted on top of a cylindrical water reservoir. The ceramic cup is covered with a green canvas (Gor-Tex) that simulates the canopy of a crop. The reservoir is filled with distilled water that evaporates out of the ceramic cup and is pulled through a suction tube that extends to the bottom of the reservoir. Underneath the fabric, the ceramic cup is covered by a special membrane that keeps rain water from seeping into the ceramic cup. A rigid wire extending from the top keeps birds from perching on top of the gauge. 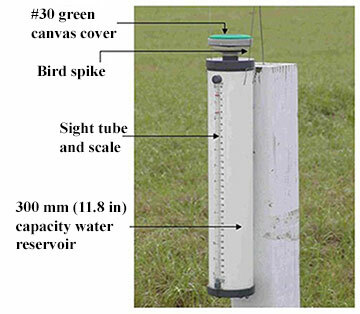 Atmometers are typically mounted on posts near irrigated fields, for example in a border or on a fence line for a soybean or alfalfa field. They also can be located alongside a road if it's surrounded by low growing crops. The site should represent average field conditions. Do not install near farm buildings, trees, or tall crops that may block the wind. The top of the ceramic cup should be at least 39 inches above ground and at least one foot above the crop canopy. Don't install an atmometer under the throw of an irrigation system, as evaporated irrigation water will leave minerals on the green cover that can inhibit water flow. University of Nebraska-Lincoln research conducted by Suat Irmak, Extension Soil and Water Resources Engineer, showed that an atmometer's ET reference values closely match the values calculated from weather station data. More importantly, the atmometers are located in growers' fields, making them especially useful for areas without nearby weather stations or for people who do not have ready access to this information. A grower or crop consultant can install an atmometer to help schedule irrigations for any field within several miles. Crop water use can be estimated by recording the weekly drop in water level. To determine the actual water use for a crop, multiply the drop in water level by a crop coefficient. Coefficients used for Nebraska are listed in the publication Using Modified Atmometers (ETgage) for Irrigation Management (UNL Extension NebGuide G1579) or on the web at http://elkhorn.unl.edu/ETGage/jsp/quickCharts.jsp. The larger the crop, the larger the crop coefficient. For corn from V16 through dent, the coefficient is 1.1. So, for example, if the ETgage dropped 1.5 inches for the week and the crop was in the V6 stage, the crop coefficient would be 0.35. Actual crop ET would be 1.5 inches multiplied by 0.35 for a total of 0.525 inches of crop water use for the week. However, if the crop stage was tassel, we would multiply 1.5 inches by 1.1 for a total of 1.65 inches for the week. An atmometer costs approximately $250 and can be used alone to manage irrigations. Typically in Nebraska we begin the season with a full soil profile. We then use a checkbook method and subtract ET information and add effective rainfall events. We'll want to always leave a little room for rainfall, but it can be difficult to accurately estimate the soil water content to decide when to make that first irrigation. Atmometers do a great job of estimating crop water use, but it's important to also monitor soil water status. To monitor soil moisture we have been using Watermark sensors that are installed at 1-, 2-, 3-, and 4-foot depths in representative areas of the fields. The sensors are usually placed in the row between plants just after crop (corn or soybeans) emergence. These sensors are glued onto PVC pipe so they can be installed, used, removed at the end of the season, and reused next season. Watermark sensors should be installed when conditions permit before the crop gets too large and can be used throughout the growing season to manage irrigations (soil moisture-based irrigation management), using suggested UNL trigger points. You'll need to prepare the Watermark sensors before installing them. The sensors should be soaked in water and then allowed to dry out, preferably two or three times prior to installation in the field. When installing sensors, be sure they are wet. Also, be sure that no extra water has soaked up into the PVC tube by tipping the sensor and making sure no water sloshes around. Irrigation events can be initiated when trigger points indicated by the Watermark sensors are reached. Trigger points listed in the online table, Irrigation Trigger Levels by Soil Types, are when 35% of the available soil water in the soil profile has been depleted. Growers will need to vary these triggers depending on system capacity, crop development stage, predicted crop ET, and point of the growing season. We don't recommend waiting until the traditional 50% depletion because it may take several days for the center pivot to make a full circle application. Thus, if the irrigation is initiated at the 50% depletion level, by the time the pivot completes the circle, the available soil water in some parts of the field may be significantly less than 50%, causing plant stress. The 35% depletion level is used as a buffer or safety strategy to minimize the risk of crop water stress. Watermark sensors and atmometers can be used together quite well for irrigation management. The Watermark sensors can help determine when to initiate the first irrigation, based on the suggested trigger points in the Extension Circular, Watermark Granular Matrix Sensor to Measure Soil Matric Potential for Irrigation Management, (EC 783), for a given soil texture. Trigger points are adjusted depending upon soil type, system capacity, and area of the state. After the initial irrigation, an atmometer can be used to estimate actual crop water use since the last irrigation, using the reference ET and crop coefficient. You can then use the Watermark sensors to monitor your irrigation decisions. It's also important to use a soil probe to compare soil water conditions in other areas of your fields where you don't have soil sensors. We recommend probing soil in other field locations for the first couple of years to be sure you have selected a representative location for your soil sensors. Between the first and last irrigation, ETgages can be used alone to make irrigation management decisions, saving you from having to make a weekly trip to the field to read the Watermark sensors. However, recent technological developments may allow you to view your Watermark sensor readings from any device with Internet access. Several companies a means for viewing your Watermark sensor readings on your laptop, iPad, or smart phone. For more information on ordering ETgages and Watermark sensors, please check with your local NRD, as many NRDs across the state offer cost share programs for these tools. (See Soil Moisture Sensor Programs Offered by Nebraska Natural Resources Districts.) You also may contact one of the authors listed below.